Widespread throughout much of South America, it’s found in Venezuela, Guyana, Suriname, French Guiana, Ecuador, Peru, Brazil, Bolivia and Argentina. Populations have also been recorded in Panama and Trinidad and Tobago. Small tributaries, swamps, marshes, pools, ditches and the margins of forest lakes. It’s often found in very shallow water or lurkng among surface vegetation. It’s not a particularly active species, so a single fish can be kept in an aquarium measuring 48″ x 18″ x 18″ (120cm x 45cm x 45cm). Juveniles can be grown on in smaller quarters. Ideally, keep it in a heavily planted tank with plenty of floating vegetation, which will allow it to exhibit its natural behaviour. In a brightly lit or sparsely decorated tank, it tends to spend a lot of its time hidden away. It can be kept in unplanted tanks, but at the very least provide lots of hiding places and refuges. Make sure the cover is very tightly fitting as it can and will escape if given the opportunity. pH: 5.5-7.5. Very adaptable and unfussy regarding water chemistry. Feeds on both insects and fish in nature. In the aquarium, its diet should consist of meaty fare such as earthworms, prawns, mussels and white fish such as lancefish. It usually refuses dried foods, although some specimens have been known to accept them over time. 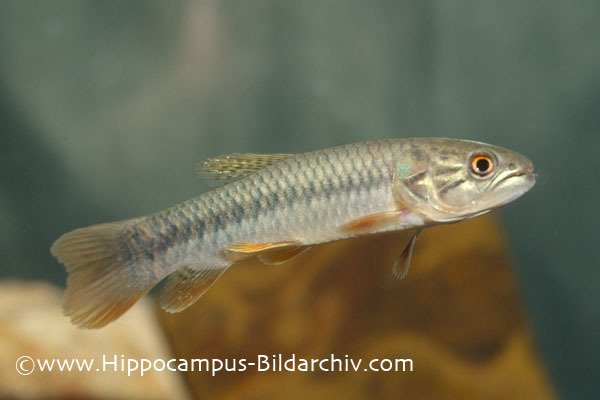 Many hobbyists feed predatory species such as this on large quantities of live ‘feeder’ fish, but there is no real benefit to this, and there is always the risk of introducing disease or parasites when feeding live fish. Despite its fearsome appearance, it can be combined with other similarly-sized species in a large tank. In order to see it act naturally, though, it’s much better off when kept alone as a single specimen. Smaller fish will be eaten, and it’s very intolerant of conspecifics, often fighting with them to the death. Unconfirmed. Mature females are likely to be rounder in the belly than males. It’s not been bred in the hobby. Also known as the golden trahira, H. unitaeniatus is the only one of the three recognised species currently in the genus to appear in the trade with any regularity. It’s really a fish suitable only for the specialist, and as with any predatory species, care must be taken when performing tank maintenance. It’s a representative of an ancient group of fishes, and possesses a modified, highly vascularised swim bladder that acts as an accessory breathing organ, allowing the fish to survive in oxygen-deficient and stagnant waters. It can often be seen rising to the surface to take in gulps of air in the aquarium. It’s also been known to travel over land for short distances to new habitats, when seasonally inundated waters begin to dry up. It’s used as a food fish in some of its native countries.